For fighter info, see Toon Link (SSBB), Toon Link (SSB4), and Toon Link (SSBU). Official artwork of Toon Link from Hyrule Warriors Legends. Toon Link (トゥーンリンク, Toon Link) is one of Link's multiple incarnations in The Legend of Zelda series. 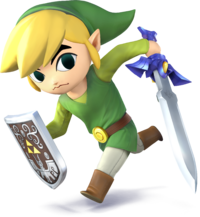 Although several Links appear with the cel-shaded art style that Toon Link's design is based on, the one that appears as a playable character in the Super Smash Bros. series is the Hero of Winds, the main protagonist of The Legend of Zelda: The Wind Waker and The Legend of Zelda: Phantom Hourglass. Official artwork of Toon Link from The Legend of Zelda: The Wind Waker. Toon Link is one of the various incarnations of Link from The Legend of Zelda series. 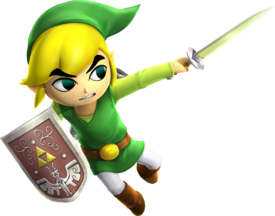 While the art style of Toon Link has been used for the Links in Four Swords, Four Swords Adventures, The Minish Cap, Spirit Tracks, and Tri Force Heroes, Toon Link refers to the Link from The Wind Waker and Phantom Hourglass. Despite this, Toon Link's trophies in Super Smash Bros. for Wii U list The Legend of Zelda: Spirit Tracks as one of his appearances, similarly to how Link's trophies mention The Legend of Zelda games regardless of whether the incarnation that appears in the Super Smash Bros. series actually appears in the games listed. Similarly, his Classic Mode route in Ultimate is based directly upon Tri Force Heroes, which canonically features the same Link as A Link Between Worlds rather than the Hero of Winds. Compared to his fellow incarnations, Toon Link's personality is one of the most diverse. Even though he canonically appears only in The Wind Waker and Phantom Hourglass, he is consistently shown to be carefree, easily excitable, and jolly to the point of smiling often. When faced with threats, however, he also shows the determination and courageousness that his fellow incarnations are renowned for. Toon Link's cartoonish design also allows him to emote exaggeratedly, a trait shared with the other incarnations that share his art style. In The Legend of Zelda: The Wind Waker, set hundreds of years after The Legend of Zelda: Ocarina of Time and within the Adult Link Timeline, the gods have flooded Hyrule, creating the Great Sea, encompassing the highest mountaintops of Hyrule. At the beginning of the game, Link's younger sister Aryll is captured by the Helmaroc King, a giant masked bird that mistook her for the pirate captain Tetra. After some persuasion, Tetra agrees to help Link chase after the Helmaroc King in order to rescue Aryll, during which Link discovers that the bird is under the control of Ganondorf, who is revealed to be searching for Princess Zelda. However, before he can clash with Ganondorf, Link is launched into the Great Sea by the Helmaroc King. After being saved by The King of Red Lions, Link then undergoes many trials, which includes acquiring the Wind Waker and rescuing Aryll, which results in The King of Red Lions bestowing him the title "Hero of Winds". With Aryll safely on board Tetra's Ship alongside the pirate crew, Link discovers that his quest is not yet complete, as Ganondorf still poses a threat to the world now that the seal holding his power has been fully broken. Tetra and The King of Red Lions are eventually revealed to be Princess Zelda and King Daphnes Nohansen Hyrule, respectively, the last members of the Royal Family of Hyrule. As a result, Link takes Zelda to the underwater Hyrule Castle to keep her and the Triforce of Wisdom safe, after which he proceeds to restore the Master Sword's power to repel evil and reassemble the Triforce of Courage. Now properly equipped, Link, with additional assistance from Zelda, manages to seal Ganondorf by plunging the Master Sword into his head just before Hyrule is fully submerged within the Great Sea, as per Daphnes' Triforce-granted wish of Link and Zelda having a future. With the world saved and Aryll safely returned to their grandmother on Outset Island, Link decides to accompany Tetra and her crew to set sail for for new lands, with Aryll, their grandmother and the rest of Outset Island's population tearfully saying goodbye while Link reciprocates the heartfelt feeling. Some time after the events of The Wind Waker, the events of The Legend of Zelda: Phantom Hourglass unfold. As the crew searches for new lands, Link, Tetra and the crew encounter the Ghost Ship during their search, which, when boarded, suddenly turns Tetra to stone and teleports Link to the World of the Ocean King, where Tetra is imprisoned by Bellum. Link finds the Phantom Hourglass, an item that protects him from the life-draining magic emitting from the Temple of the Ocean King, but only as long as it has sand in it. In addition to the Hourglass, he is accompanied by Ciela, a new fairy companion, and Linebeck, a cowardly and greedy captain. Together, they journey to various islands that bring Link one step closer to defeating Bellum. Eventually, Link forges the Phantom Sword and defeats Bellum, saving Tetra. Oshus, the Ocean King, is restored to his original form, and he transports Link and Tetra back to their own realm. Tetra's crew claims everything to be a dream, as they state that only ten minutes passed when they supposedly fell asleep. However, Link discovers that he is still is possession of the now-empty Phantom Hourglass and sees the S.S. Linebeck on the horizon, which confirms that his adventure in the World of the Ocean King was indeed real. Sometime after the events of Phantom Hourglass, Tetra's crew and Link discover a new land, which they rechristen New Hyrule. A hundred years after this, the events for The Legend of Zelda: Spirit Tracks unfold and follow a new Link and a new Princess Zelda, the latter of whom is Tetra's descendant. Unlike Tetra, the Hero of Winds does not make any kind of appearance whatsoever in Spirit Tracks. However, the Hero of Winds' legacy clearly lives on in New Hyrule: his signature clothing is the basis for the uniform worn by the country's soldiers, while the exact same shield that he wielded during Phantom Hourglass can be acquired from Niko, one of his and Tetra's shipmates. Toon Link, as he appears in Super Smash Bros. Brawl. Toon Link is an unlockable character in Super Smash Bros. Brawl, in which he can be unlocked by either clearing Adventure Mode: The Subspace Emissary and/or going through the hidden door in The Forest stage, clearing Classic Mode with any character on any difficulty after clearing The Subspace Emissary, or by participating in 400 VS matches. As a semi-clone of Young Link, Toon Link's moveset is almost identical to his and, by extension, Link's, although there are some differences. One of the most obvious is his Bomb, which emits an explosion that uses the art style from The Wind Waker and Phantom Hourglass. However, there are mechanical differences as well, as the explosion has greater range, but less power compared to Young Link and Link's. Toon Link's neutral special, Hero's Bow, charges faster than Young Link's and shoots arrows farther compared to his and Link's. However, it charges slower than Link's, and his arrows fly slower than Link's. Toon Link's Spin Attack functions like Young Link's, as it traps opponents by hitting them multiple times before launching them away. However, it grants more distance when used as a recovery move, especially in comparison to Link's. Like Young Link, Toon Link possesses the Boomerang as his side special and as such, it provides noticeable differences compared to Link's Gale Boomerang: it does not push/pull opponents and grants more control when throwing it. In regard to mobility, Toon Link's only differences from Young Link are his higher double jump and lower traction. However, Toon Link's mobility differs considerably from Link's: he walks and dashes faster than Link, his jump is higher and both it and his falling speed are floaty than Link's, and he can wall jump like Young Link. Toon Link's overall power is also similar to Young Link's, yet noticeably lower than Link's. Much like his special moves, a number of Toon Link's standard moves differ from theirs. The most noticeable examples include his up smash; neutral, forward, back and down aerials; and forward and back throws. Toon Link is currently ranked 13th on the tier list, placing him in the C+ tier. This makes him both the highest ranking incarnation of Link in the Super Smash Bros. series, and the highest ranking representative of The Legend of Zelda series in Brawl. Toon Link has a trophy that is awarded each time Classic Mode is completed with Toon Link on any difficulty. See Triforce Slash for the trophy description of Toon Link's Final Smash. Link as he appeared in The Wind Waker and Phantom Hourglass, with big eyes and an expressive face. He lived peacefully on Outset Island until a bird captured his little sister, and he came to her rescue. In The Wind Waker, he had to crawl, press up to walls, and the like. His green clothes were worn on his 12th birthday and are the lucky outfit of the hero of legend. Link in his traditional clothing. He wears a blue, V-neck, long-sleeved top with a shrimp pattern, coordinated with slender orange pants. It makes you think that, even on his home, Outset Island, Link was quite the fashion leader, and suggests that he may have changed into his green hero's clothing somewhat grudgingly. 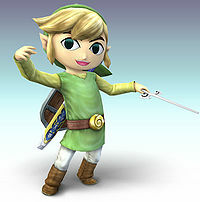 Toon Link, as he appears in Super Smash Bros. 4. 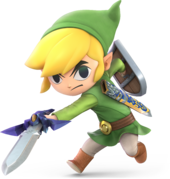 Toon Link returns as a playable character in Super Smash Bros. 4, now as a starter character rather than as an unlockable character. His appearance is largely unchanged since Brawl, with the only alterations being a more cartoonish aesthetic instead of the realistic aesthetic used in Brawl; his proportions being more in line with his appearance in The Legend of Zelda: The Wind Waker HD; and his overall color scheme being noticeably brighter. Spirit Tracks Link as a background character in Super Smash Bros. for 3DS. It should be noted that this is a pre-release picture, as Link, Toon Link and Spirit Tracks Link cannot appear on Spirit Train at the same time in the final release of SSB4. The Spirit Tracks incarnation of Link also appears on the Spirit Train stage, although if Toon Link and/or Link fights on the stage, Alfonzo will be the conductor instead. Spirit Tracks Link also has two trophies: one featuring him wearing his Engineer's Clothes, and one featuring him wearing the Recruit Uniform and playing the Spirit Flute. Toon Link is currently ranked 23rd on the tier list. While his overall power was nerfed in the transition from Brawl, he retains his powerful zoning ability and even gained an improved grab game, which was arguably his greatest flaw in Brawl. His improved grab game allows for better spacing using his grab aerial and grants him a KO option in the form of his back throw. Like in Brawl, Toon Link has achieved decent tournament representation and impressive results. This cartoonish version of Link is how he appeared in The Legend of Zelda: Wind Waker and a few other titles. In Smash Bros., he uses moves much like his older, taller counterpart. His small size gives him extra speed, though, so take advantage of that to send your foes flying. This cartoonish version of young Link is how he appears in The Legend of Zelda: The Wind Waker and a few other titles. While he shares some moves with his older counterpart, he's a very different fighter. Take advantage of his size and speed to whirl past enemies and bombard them with long-range attacks. Toon Link's Bomb move doesn't deal much damage, but the blast radius is pretty big. His bombs can be thrown in all directions, damaging or distracting your foes. Also, his up special Spin Attack keeps him airborne longer than Link's version. For some launching power, use the side smash attack. Toon Link's bombs don't do much damage, but their large blast radius makes it easy to hit foes with them. You can also throw them in any directions, making them a great diversionary tactic. His Spin Attack gives him more air-time than Link. His side smash may seem weak, but press the button again for a second hit that'll really send 'em flying! Link is well known for his green clothing, a look he has sported throughout time. But in Spirit Tracks, he dons a blue uniform with a red cap instead. The cap is decorated with a dove, the symbol of the Royal Engineers. Playing the Song of Birds will call a dove to roost! Ask 100 people what colour Link's outfit is, and they'll all say "green", guaranteed. However, in The Legend of Zelda: Spirit Tracks, he also sports a dark-blue engineer's uniform. Train-driving and world-saving are two skills that should be on every hero's CV! You might feel sorry for this version of Link, what with him living a life on fixed rails rather than exploring the seas or the skies. But, like the smoke from his train, that feeling will soon disappear when you see that after leaving Aboda Village, the young engineer's quest to restore the Spirit Tracks is filled with adventure. You might feel sorry for this version of Link, what with him living a life on fixed rails rather than exploring the seas or the skies. But, like the smoke from his train, that feeling will soon disappear when you see that, after leaving Outset Village, the young engineer's quest to restore the Spirit Tracks is filled with adventure. Toon Link, as he appears in Super Smash Bros. Ultimate. Toon Link was confirmed to return in Super Smash Bros. Ultimate during Nintendo's E3 2018 presentation on June 12th. Unlike in Super Smash Bros. 4, he has reverted to being an unlockable character. Toon Link was initially conceived by artist Yoshiki Haruhana during the making of The Legend of Zelda: The Wind Waker. Though The Legend of Zelda: Four Swords was released weeks earlier, the development of The Wind Waker began earlier and established the visual style. Toon Link's artwork in Super Smash Bros. Brawl is nearly identical to his artwork in The Wind Waker, although the former is missing the apparent gust of wind, has his sword and shield, and his hairstyle is mirrored. Prior to Super Smash Bros. Ultimate, Toon Link, Young Link and Roy were the only swordsmen in the Super Smash Bros. series whose swords consistently produced a punch/kick sound effect instead of a slashing sound effect for the majority of their moves. Toon Link, Young Link and Cloud Strife are the only swordsmen in the Super Smash Bros. series capable of wall jumping. Despite being able to crawl in their respective games, Toon Link, Mario and Pit are unable to do so in the Super Smash Bros. series. Toon Link is the only playable character from The Legend of Zelda series to have debuted in the 21st century. Toon Link is the only playable character from The Legend of Zelda whose design remains the same for more than two Super Smash Bros. games. This is very similar to how his "Toon" design has been used for more games in his home series than any of his realistic designs. Despite being associated with the Adult Timeline, the "Toon" design has also been used in every other established timeline: the Unified Timeline (Four Swords and The Minish Cap), the Child Timeline (Four Swords Adventures), and the Downfall Timeline (Tri Force Heroes). Interestingly enough, Skyward Sword and Breath of the Wild used cel-shading like the "Toon" games, but instead featured anatomically realistic character designs. ↑ Iwata Asks: The Legend of Zelda: The Wind Waker HD: How Toon Link Was Born. Nintendo. This page was last edited on April 24, 2019, at 18:59.